powerlines through "Wild & Wonderful" West Virginia. Please do all you can so WV doesn't become "Wired & Ugly"! not only if the proposed route is on your land! Join our PATH Newsletter! - Stay Informed! Bill Howley's Informative, up-to-the-minute PATH Blog for Calhoun County - GREAT for ALL Counties! Bill's post: TOOLS FOR THE PSC HEARINGS - Plan your statement. Be prepared! Subscribe to this feed and stay informed! This 2 page ACTION flyer tells you who to write to, what to say and where to mail it, fax it, email it or even call! for your county, then print it out and distribute as many wherever you can! I've found store owners are happy to display a petition along with "action" information for people to take with them, and neighbors are happy to sign! Explanation of the issues, the players, the impact and what's needed - West Virginia is ours, NO MORE TOWERS! Sierra Club contact information is in here too - these folks are crucial to the fight, and in need of donations so please help if you can! View maps of the proposed lines, watch project updates, sign up for news and updates via your email and stay informed about the state proceedings. PowerPoint very informative presentation October 2008 - Still Pertinent in 2009! to share all they've learned and to mobilize and join efforts of opposition. This map shows the PROPOSED routes as of September 2008 throughout West Virgina. NOTE the light turquoise lines - they are WV SCENIC routes and won't be so scenic should this line go through! PLEASE BEWARE!!! Just because the proposed routes don't go anywhere near your land, it doesn't mean the final route won't. They have done the "Powerline Bait & Switch" game before - and those folks were caught unaware. We need to mobilize all of WV now! PATH SITE - Potamac Appalachian Transmission Highline - sign up for their information list! WEST VIRGINIA PUBLIC SERVICE COMMISSION - you can view all the documents and protest letters, even yours! TAKE ALL SHADES OF GREEN ENVIRONMENTAL ACTION in our beautiful state! West Virginia Environmental Council "All Shades of Green Working Together"
Coal is not the answer! 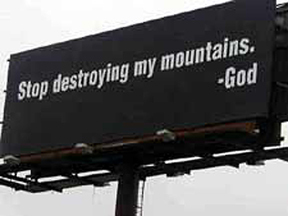 Help end mountain top removal! Take action! Stop mountaintop removal coal mining! 11-21-08 Wall Street Journal - It could be a permanent downtrend! 40 minutes to meet 100 percent of the entire world's energy needs for a full year. every day to also meet 100 percent of US electricity demand.